If you feel like your emails are getting lost in your prospects’ inboxes, video is the headlamp, map, and flare to get your message home. 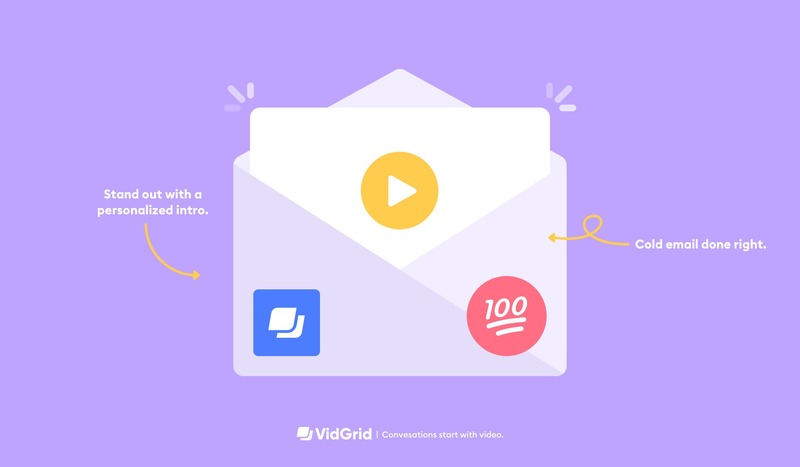 Sales and marketing teams who use videos in their outbound emails see up to 20% more opens, 5x more click-throughs, 8x more responses, 20% more closed deals, and 30% higher deal sizes. In the ever-advancing world of technology, AI, and automation; video inserts humanity back into the sales process. You can build a face-to-face connection, show your credibility through your tone of voice, facial expressions, and body language, and more succinctly convey your value by showing your product in action. Now, this does not mean that video is a perfect enhancement for every message. Or that one type of video will work in every situation. Let’s hone in on 1-to-many videos. 1-to-many videos are single videos that can be shared with multiple viewers. With super hot leads, you probably want to make them their own personalized prospecting video. The 1-to-many video is perfect when you want to educate or qualify leads through an automated workflow. GridTip: This is not a personalized video. Don’t say “I made this video just for you,” because you didn’t. And your viewer is smart. Show and tell a new product for interested parties. Explain how the new product will provide value, and show them how it looks in action. Nothing is more powerful that a happy customer advocating for you in his or her own voice. Share their stories to similar companies who may find a similar type of value. Tell your potential buyers why your product is better, and show your product in action. Show them your friendly face and tell them you will soon be in the same room. Make sure to include your calendar so they can schedule time to meet with you in person. GridTip: Someone watching a 1-to-many video may indicate that they are hot enough to warrant a 1-to-1 video. Follow up! Capture attention right away with a moving video preview in your email. (See Email + Video Dream Team post for email more tips). Keep your video short and concise. Only 37% of viewers will sit through a video longer than 90 seconds. Finish with a strong video call-to-action.